We want your involvement, we want your feedback, and we want to know what works and what doesn't. Most importantly, we want you to be proud you're attending Live! 360 DEV, and we encourage you to tell as many people as possible about it! Twitter – follow us at @live360events. We watch our stream closely, and work very hard to tweet out relevant, engaging, and interesting tidbits. Plus, almost every single one of our expert speakers has an active Twitter feed, and they all follow us, plus we list all of their handles for you. This is a great forum for sharing and asking all your questions. 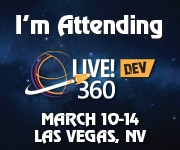 Use #live360 while on-site to stay up-to-date on the latest events and happenings. Facebook – we want you to like us! Check out relevant articles, view photos, & get updates in real-time! LinkedIn – join the discussion. Tap into our community to get tips, ideas, & new ways to work. Tweet that you are attending.